Will shares of Twitter Inc (NYSE:TWTR) get hit as hard as Facebook, Inc. (NASDAQ:FB) thanks to the latter’s recent user data flare-up? Would it be surprising to learn that Twitter stock has not only been hit hard as well, but has actually fallen more than FB stock? Yep, that’s right. From its highs, Twitter stock is down about 24%, while Facebook stock is off “just” 20% from its highs. Facebook is a mega-cap tech stock, still commanding a market cap of $450 billion. It’s one of the largest positions in the PowerShares QQQ Trust, Series 1 (ETF) (NASDAQ:QQQ) and is a key component to FAANG — which also includes Apple Inc. (NASDAQ:AAPL), Amazon.com, Inc. (NASDAQ:AMZN), Netflix, Inc. (NASDAQ:NFLX) and Alphabet Inc (NASDAQ:GOOG, NASDAQ:GOOGL). When FB sells off 20%, it drags down many of the FAANG components, which then weighs on the QQQ ETF. As a result, it drags down many other stocks in the tech sector. But Is It Fair for Twitter Stock? Is the entire selloff in the QQQ ETF because of FB stock? Of course not. But one could still question whether its fair for Twitter stock to come under even more pressure than its Silicon Valley rival. My first reaction is that it’s not fair. After all, FB management is at fault for being so reckless with its users’ data — not Twitter. But upon further inspection, other social media companies — like Twitter and Snap Inc (NYSE:SNAP) — have also been reported to sell its users’ data. It could make all three stocks subject to tighter regulations and further pushback from users and advertisers. Specifically, Citron Research’s Andrew Left recently pointed out that Twitter’s full-year ad revenue declined to $2.11 billion from $2.25 billion in the year prior, yet data licensing revenue climbed from $282 million to $333 million year-over-year. It’s forecast to climb again this year. 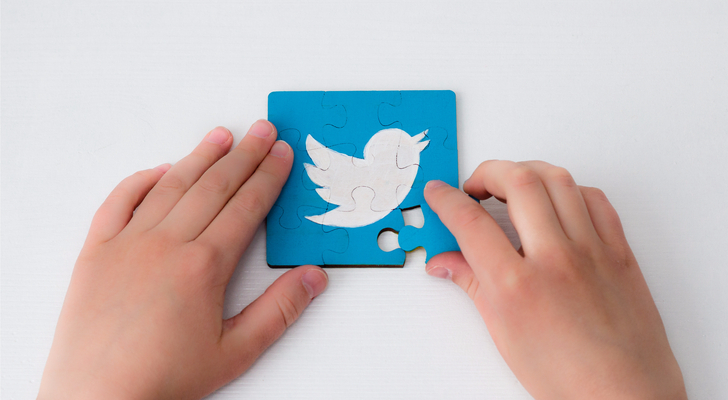 While only 13% of revenue, it’s apparent that Twitter engages in the selling of data, too. Notably, Facebook’s data is far more intensive on its users than Twitter’s data. Still, at the very least, one might expect the company to disengage or at least slow its roll in this “high margin” business, as CFO Ned Segal has said. At most, you’d expect management to throttle this business and see a regulatory hammer swung down on it. It’s worth pointing out that Left has a $25 price target. In light of TWTR engaging in similar — albeit seemingly less destructive — behavior as Facebook, maybe Twitter stock really does have more downside potential; maybe it did deserve its beating. After such a fall, taking a short position doesn’t make much sense as the risk/reward isn’t that attractive. I think shares could be setting up nicely for bulls, though. 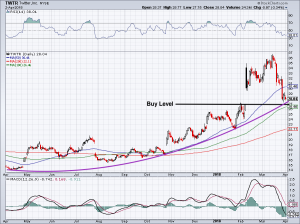 After nailing a big, bullish trade in Twitter stock earlier this year, we said investors can consider buying again near $27. Note how well TWTR stock held up during the early February selloff, as investors shrugged off the 10% decline in the S&P 500 in 10 days. The start of that move began at $27, with TWTR gapping higher on earnings. Not only would a return to $27 fill that gap, but the prior high should act as support, even if only temporary. There’s two other notes to point out. First, the 100-day moving average is just below at $26.50, and it too should act as support. 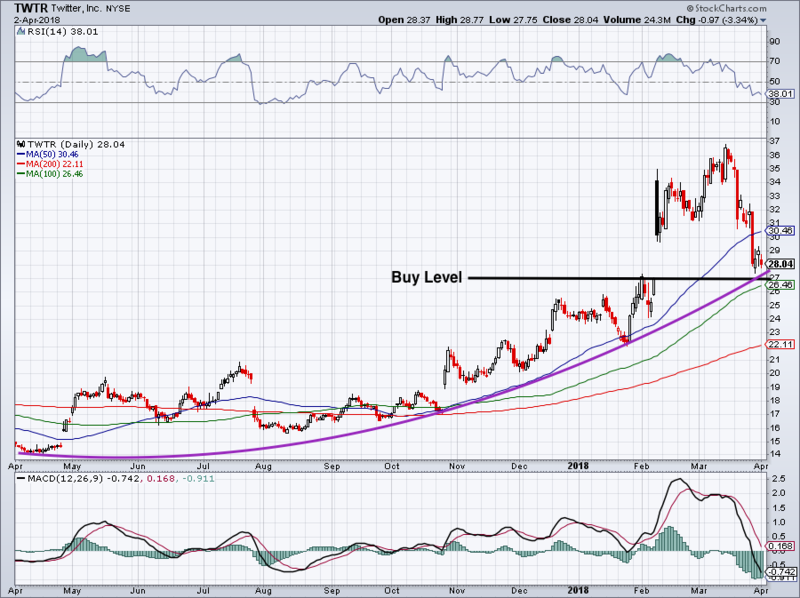 Finally, adjusting for Twitter stock’s big move higher, we have a sloped trend-line (in purple). That would signal support — depending on the measurement — should stand anywhere between $26 and $27.50-ish. Given that these platforms are still the best way for advertisers to reach its customers, business won’t dry up overnight. But revenue growth could come under pressure, and regulations could increase. Make no mistake: the social media space could certainly have speed bumps going forward. For those reasons, these stocks could be susceptible to further declines and more volatility in the future. Article printed from InvestorPlace Media, https://investorplace.com/2018/04/it-may-be-time-to-go-long-in-twitter-stock/.